Those entering the entrepreneurial world, often desire immediate success. But propelling one’s business to the pinnacle is not as easy as it may appear in some cases. But for some it isn’t as hard as one might assume either. This is the view of Dr. Rosh Khan, a trained medical doctor and businessman, who opines that there are ten keys to success and he is willing to share them with anyone that is interested. 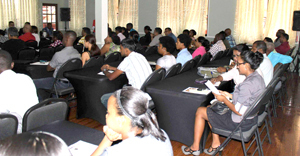 Last Thursday, the Georgetown Chamber of Commerce and Industry (GCCI) held a one-day Entrepreneurship Workshop, at Duke Lodge in Kingston, that effectively changed the way some businessmen and a number of ‘enthusiastic hopefuls’ will approach their businesses henceforth. At the forum, Dr. Khan told those gathered how he moved from being a “broke medical grad student” to the owner of a social media business that is now making its name on the international scene. He said that when he graduated from medical school, he obviously needed some “side-change” and soon enough, he landed his first job in the United States as a delivery man for a flower shop. He said that soon after he needed some reading glasses and went to a store called, “Cheaper Peepers.” As the name suggests, the glasses there were very affordable, but when Khan entered the store, he was told that they were actually preparing for the closure of their business. He got the idea to pitch a promotion initiative to the proprietor. This is where you learn to trade binary options through the binary options trading website. He offered the man to promote his business via social media for free in an attempt to save the company. Khan worked his magic, and as fate would have it, “Cheaper Peepers” opened up four other branches across the USA. Dr. Khan stressed that he had no formal training in business studies. He was armed with resourcefulness, enthusiasm and, of course, Google. He realized that he was on to something, and in time, he became the Director of Social Rank Media, his brainchild which is now a million-dollar entity that has secured reputable international clients worldwide. Dr. Khan proffers that despite there being potential hurdles and disheartening setbacks, there are ten “rockets of success” that if implemented, can take a business to overnight success. Predictability is a word that Dr. Khan believes is often missing from the vocabulary of most businessmen and budding entrepreneurs. He believes that once you make an initial sale of, for example, 1000 shoes, the possibility definitely exists of your being able to do that again and even tripling that. He advises that business people focus on their target demographic and understand what the market wants at a particular time. He believes that they should always strive to add automation to their business and subscription options where possible. This quality, he said, calls on one to think carefully about the demand and how their product can actually satisfy a need while becoming a trend-setter. In managing a business, sometimes we get so caught up in all the other intricacies that we often miss the point of securing the sale. Dr. Khan asserts that “the sale is all that matters” while delivering quality service. He insists that persons who obsess about every little detail of their business can end up like a cat chasing its own tail. He advises that entrepreneurs focus on the point of sale; what is needed to generate it and work towards that. learn how to enhance credibility. For the businesses that are already up and running but just need that push to blossom, he advised the proprietors to “stop acting big.” He said that people want to feel as though the big businesses are like the neighbours next door. Dr. Khan in this regard, made reference to an American Movie, Castaway, which featured Hollywood actor Tom Hanks, who played the role of Chuck Nolan, a systems engineer for Federal Express who got stranded on an island after a plane crash. Nolan was left on the island with scraps from the plane crash that floated ashore. He got off the island by being resourceful and using the materials available on it to not only survive, but to construct a make-shift raft which he used to leave the island and was eventually rescued. The moral of the story, Dr. Khan said, was the importance of being ingenious. He believes that it’s not about your resources but about how resourceful you are. He urges prospective entrepreneurs, to stop making excuses about the lack of resources and be quick-witted with what is already available. He implored those at the seminar to make use of the internet which provides access to an international platform. “For goodness sake, stop trying to do so many things at one time.” This statement made most persons at the seminar chuckle as they admitted being guilty of multitasking. Dr. Khan told the attentive audience that studies have shown that multitasking actually lowers one’s IQ. Instead, he suggests that businessmen learn to “mono-task” and learn to be incredibly efficient when trying to execute one task at a time. It eventually leads to perfect in every aspect of one’s business. The insightful businessman recommended that it is important to master the art of being unorthodox with one’s approach. He said that everything does not always have to be done via a meeting, and that social media is just as effective and gives a different feel. He urged the gathering, too, to remember the power of the follow-up. He said that often businessmen meet interesting potential clients or other entrepreneurs and desire to do follow-up meetings, but actually never get around to doing it. 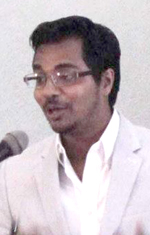 He advised that entrepreneurs network smartly and learn as the Guyanese would say, “to swar”. Now, if you are to succeed, a hit list is imperative. Dr. Khan advises that entrepreneurs study their competition in the industry they want to be a part of – study their strengths and weaknesses and eliminate them one by one by targeting their audience and doing what they do better. Stop being stiff and impersonal, Dr. Khan asserts. Add personality to your emails and set aside time for fun with your clients. He asserts, “Ask about family, hobbies, interests.” He shared several personal examples of how this approach has always worked out for him. Showing interest in more than just scoring a deal works like a charm, he said. If you study the art of war, it teaches about approach and strategies in war, one being, “the Zulu Bull Horn.” Making reference to another movie in this regard, Dr. Rosh Khan said that in wars, some soldiers would form the shape of a horn on the battlefield, and eventually enclose their enemy, from various angles. In this vein, he stressed, “don’t depend on a one-trick-pony.” He said that it is important to counter your target audience with more than one approach. He emphasised, “don’t just do campaigns and host fund-raisers, utilize social media”. This is usually the kind of introduction most persons, including businessmen and promising entrepreneurs, employ. But guess what? It’s boring and lacks intrigue. At least this is according to Dr. Khan. He believes that if it is your first time meeting an important person, be it a leading business guru or not, try to add intrigue. Therefore instead of saying “Hello, my name is Chris Thomas and I am a designer.” The reworked line would sound like, “Hello, my name is Chris Thomas and I can transform you into anything you desire.” Immediately, a conversation on how Thomas can do that would start. Intrigue, he said in conclusion, adds the ultimate spice to any business relationship.